This modem is a USB modem with a small footprint and a stackable design. This modem is dependable, very affordable and is easy to install. You can install these units in multiple on a single computer. If you use a USB hub, make sure it is a powered hub, in fact Multitech recommends that a powered hub always be used with USB modems. This modem is a good value. Cons: This Multitech modem will not achieve maximum fax speeds consistently for incoming faxes, but will typically negotiate session speeds at 21600 or 26400 bps. Outgoing fax sessions speeds are typically higher under good line conditions. Make sure you get the ZBA-USB-CDC model. There is an earlier model (non CDC) that is being discontinued by MultiTech, if you find this modem for much less than $110, you may be looking at the discontinued model, be careful about the model. This is a multi modem card that incorporates multiple modems on a single card. It comes in 4 and 8 port models. This modem is very reliable. The modem requires a PCIe slot which is found on most recently manufactured computers. Internal Card. This modem is a full sized card and requires a full size case to install. It is a tight installation but should not be too difficult if your computer will accommodate the board's length. Same comments as above regarding fax speeds also apply to this model. Do not confuse with the ISI5634PCI. The 5634 is a full sized board and uses a PCI slot rather than a PCIe slot, this board has been around a while and is being discontinued. 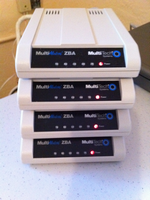 Visit Multitech's website to learn more about their fax modems. Pros: This board is the ultimate in reliability and will consistently achieve maximum fax connection speeds under good line conditions. It has a small footprint and will install easily into any available PCIe slot. This board is also available in a single modem design. The multi-port cards come in 2, 4 and 8 port models. If you are after maximum reliability and cost is not a huge factor, this is the modem of choice. Visit MainPine's website to learn more about their fax modems. These are the only Class 2.1 modems we know about with the exception of the Perle modems which we did not test.